If you recently moved from Facebook to Google+ just want to try something new. And want to know more about Google’s largest social networking site Google+. So here we already mention How To Watch YouTube Video’s With Your Friends in Google+ Hangout, How to Upload iPhone Photos To Google+, Move Your Facebook Photos To Google+ with Fotolink and How To Add Facebook Friends Into Google Plus. 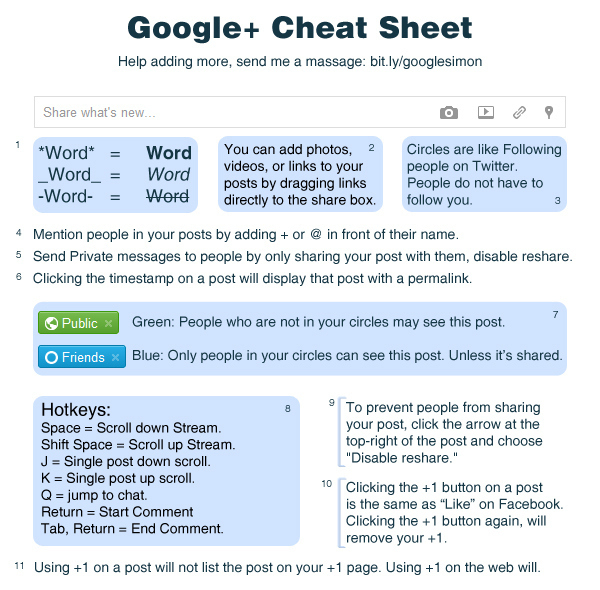 And if you are looking for some of the best Google+ Shortcuts and cheatsheets, to use Google+ as a pro. Here is the screenshot created by Google+ user Simon Laustsen, which help you to understand the Shortcut and Cheats of Google+. Instead on using +1 on Google plus page I think Google should come up with something different. Because I always thought that the +1s we do on a post on G= does matter in SERP..